Let's duel! Yu-Gi-Oh! is finally getting a line of Funko Pop figures. The company has announced that a series of four figures will debut this August based on the beloved Japanese manga. 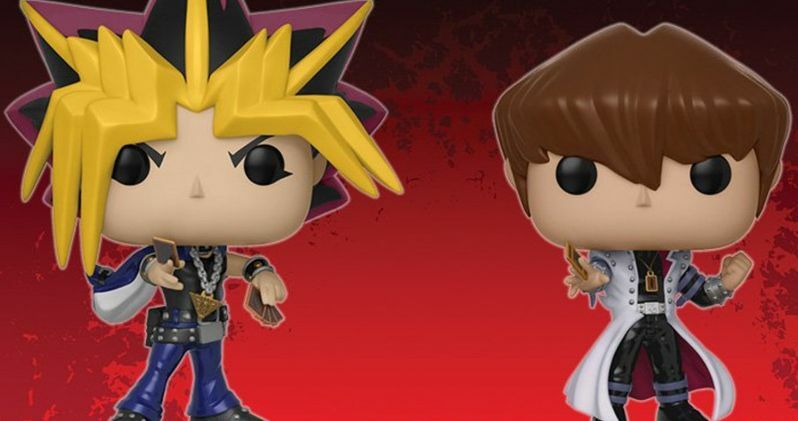 Yami Yugi, his rival Seto Kaiba, the Dark Magician Girl and the feared Blue Eyes White Dragon are all getting their very own Funko Pop figures. Considering just how many reasonably obscure figures from pop culture have been given Pops in the past, it's pretty amazing that it took this long for Yu-Gi-Oh! to get a line, but better late than never in this case. Here's what Funko had to say about the upcoming line of figures in a blog post. "Nothing frightens opponents quite like summoning Blue-Eyes White Dragon who attacks with incredible power, along with uncontrolled ferocity and aggressive dragon strikes. Or perhaps Dark Magician Girl is more your speed. Her spells are not to be taken lightly. Of course, you're going to need a duelist to wield these two powerful monsters and few duelists are stronger than rivals Yami Yugi and Seto Kaiba. Giant monsters! Powerful magic! Collect the entire Yu-Gi-Oh! Pop! Animation series to unleash your full dueling powers upon the world." 4K Media Inc., subsidiary of Konami Digital Entertainment, the company in charge of Yu-Gi-Oh!, recently announced an expanded licensing deal in various countries around the world for more merchandise based on the franchise, the U.S. included. It's one of the most popular manga and anime properties in the world and it's about time that Funko got in on the action. These initial Pop figures will arrive on shelves just after San Diego Comic-Con. Perhaps Funko will bring some Yu-Gi-Oh! exclusives to the event this year in anticipation of this line's forthcoming release? The world was first introduced to Yu-Gi-Oh! via the manga series in 1996. Once it was adapted into an anime in 1998, things really took off. The anime heavily condensed the material from the manga down, but its focus on the Duel Monsters card game that ultimately turned the series into a globally popular and beloved property. This eventually led to a series of animated movies and the wildly popular trading card game. The card game earned the Guinness World Record for being the most popular trading card game ever, with more than 25 billion cards sold, in 2011. For now, it looks like this run is going to be limited to four figures, but assuming it does well, and we have every reason to assume it will, the company is likely to expand the line in the future. Any love for Joey Wheeler or the Harpie Lady Sisters? The Funko blog post didn't give a specific date for the release of this Yu-Gi-Oh! Pop figure line, but be on the lookout for the figures on shelves in August. You can check out a preview of the figures for yourself below.